Author Nigel Cooper gives us an exclusive extract of his second novel, along with some hard-hitting advice for would-be writers. 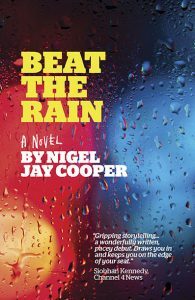 Despite wanting to write novels since I was a child and doing an MA in Creative Writing 16 years ago, it took me until I turned 40 to write my debut novel Beat The Rain. Fitting it in around a relationship, two young children, a dog and a business sometimes seemed impossible – but it wasn’t. Not much is if you set your mind to it. My debut novel Beat The Rain will be published by Roundfire Books in July 2016. It deals with the decline of a dysfunctional relationship, seen through alternating viewpoints of the husband and wife in question. At first glance, this might seem an odd subject for me to have chosen – I’ve been in a happy relationship for 22 years, since I was a teenager. But I’m fascinated by the nature of ‘truth’ and the fact that two people can experience the same thing yet have vastly different subjective truths about it. I like to explore the disconnect these ‘multiple truths’ cause my characters. Finding the time to write is always tough – I think most authors with a family and other work commitments would say the same. For years, I wasn’t writing at all. I only finished Beat The Rain because I turned 40 and realised I hadn’t even tried to achieve my dream of being a novelist. I had a list of excuses as long as my arm why this was the case – I run a business, I have two young children, my fingers have fallen off. All nonsense, of course (I talk more about this in my blog article ‘does life rob you of your dreams’). The truth was simple – I hadn’t achieved my dream of becoming a novelist because I wasn’t actually writing. There wasn’t anything more to it than that. So I set myself the task of writing for two hours every night – usually after putting the children to bed and eating dinner. It took me about four months to finish the novel once I dedicated myself to it. My advice for any budding author is simple: write. Don’t make excuses about lack of time and stop pretending the world is robbing you of the opportunity to write – find the time, make the time. Write. If you don’t, you’ll never have anything new to publish.